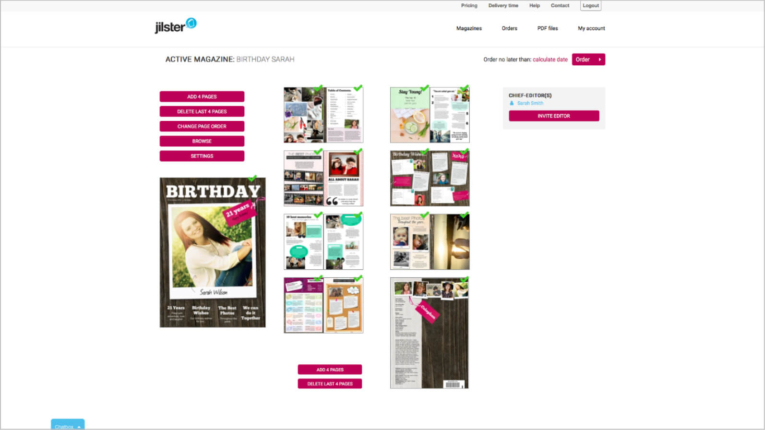 Interested in a high quality PDF file (300 dpi) of your magazine? While this is not part of our standard offer since we specialize in printing magazines, we do make exceptions in some cases. For example when shipping to distant locations may become difficult or costly. Contact us for more information. There are a few PDF files to choose from: A regular quality (72 dpi) PDF file of the entire magazine, or a high quality (300 dpi) PDF of the magazine cover. Remember to check the boxes for the terms and conditions and privacy statement. Once the payment has been completed you will receive an automatic confirmation e-mail and within a few minutes you will be able to download your PDF file in your account at 'PDF files'. What is the price of a magazine? The price of a magazine depends on the amount of pages, the format and the amount of magazines. Use the price calculator on the pricing page to calculate how much a magazine costs. How do I order a sample copy of my magazine? You can order a sample copy by going through the regular order process. There will be an option to order a sample copy. 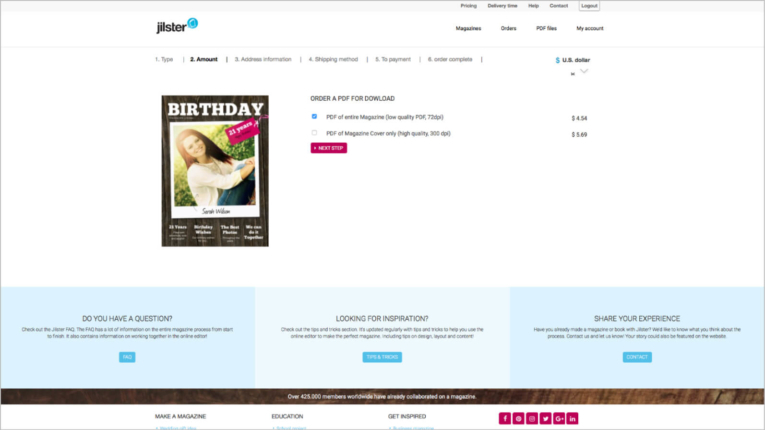 The price of a sample copy is the price of a single magazine when ordering 100 copies. Find the price of a sample copy by using the price calculator. Simply enter your magazine’s page numbers and enter 100 as the amount. The price per magazine is the price for one sample copy of your magazine. A sample copy has a transparent watermark and is not a final print. There is no difference in shipping time. 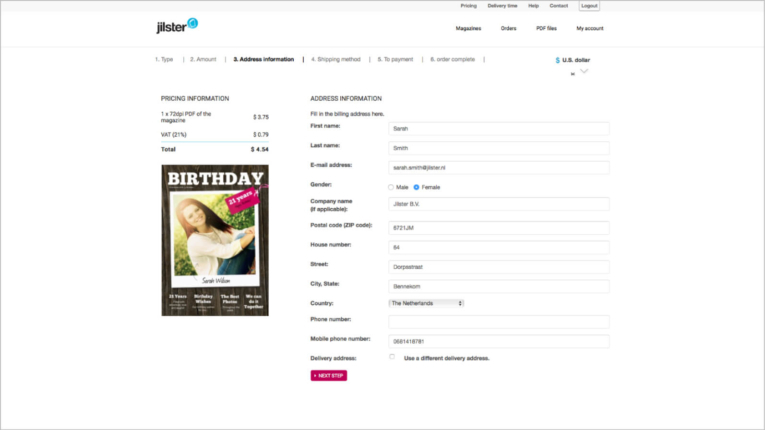 Can I order different formats during the same order process? The different magazine formats all have their own production line, this is why the different formats cannot be ordered together. If you would like different formats of the same magazine, they will have to be ordered separately. After the payment has been completed you will receive an order confirmation e-mail containing the order number. This e-mail will also contain the invoice. You can also find the invoice in your account at ‘My orders’. Can I order extra magazine at a later time? Yes, you can always order more magazines at a later time. Your magazine(s) will be saved as long as you keep the ‘expiration date’ up to date. You can edit, update, and order it at any time by going through the regular order process. How do I order a high quality PDF file (300 dpi) of my entire magazine? We’re afraid it’s not possible to order a high quality PDF file (300 dpi) of your entire magazine. We offer a free online magazine editor and free online magazine sharing. Our business relies entirely on customers ordering printed copies of their magazine. How can I find out what the status of my order is? After you have finished ordering, you will receive a confirmation e-mail. This e-mail message will contain information about the expected delivery date. When your magazines have been printed, the printer will ship them. That is when you will automatically receive another e-mail: in this message you will find a link to the track & trace information, where you can keep an eye on the delivery status of your order. 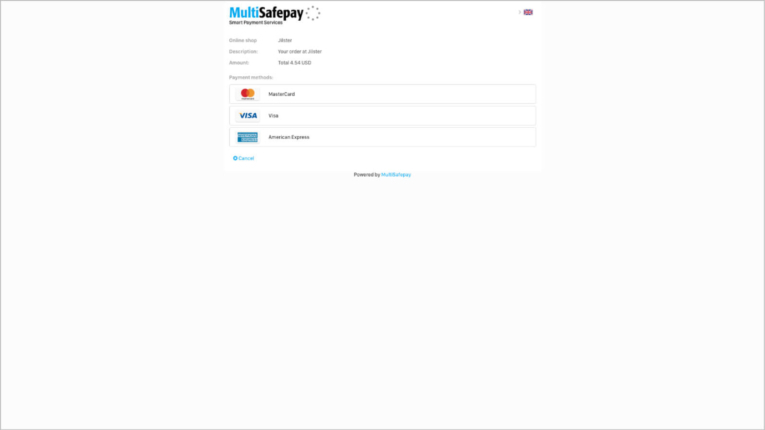 If it isn’t possible for your to complete your payment online, please contact us so we can discuss your options. 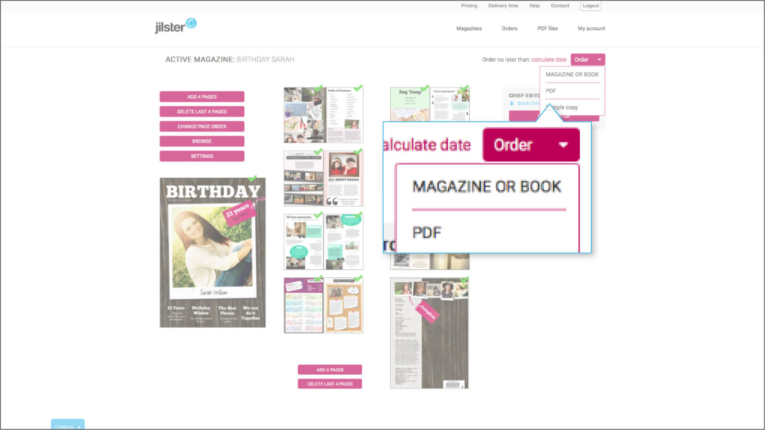 Check the price of a printed magazine by entering your desired printing option, the number of pages and the number of copies you wish do order into our price calculator. An online magazine is free. 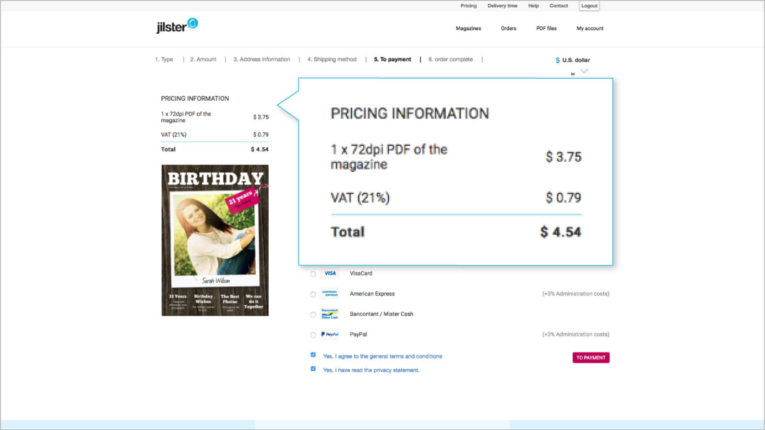 More information about the price of PDF files and sample magazines can be found on the pricing page (scroll down).